We believe meaningful outcomes are the ultimate measure of quality and value in home care. 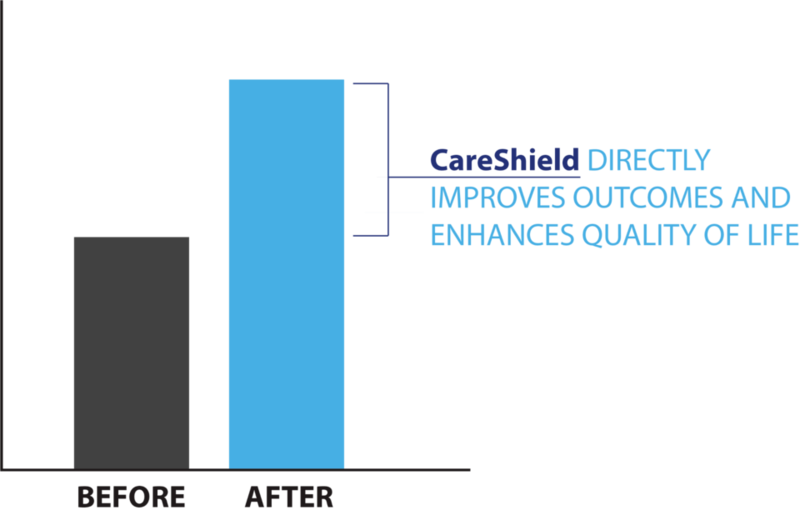 At CareShield, reinventing the home care industry begins with a new approach that unlocks the full value that exists in home care by delivering the results that matter most to our clients - meaningful outcomes. Here are just some of the meaningful outcomes and measurable results our clients experience. There are a number of factors that impact the daily life experience of an individual and their quality of life. We focus on every aspect related to improving quality of life through a comprehensive care approach that is tailored to specific conditions and situations. For those receiving care at home, changes in health condition are fairly common. The problem is most status changes are not detected early enough which can result in severe complications. We prevent complications by working with our clients to adhere to their specific care plans and use real-time insight to identify condition changes as they take place. We reduce unnecessary hospital admissions by combining condition specific clinical knowledge and real-time insight to quickly triage and communicate condition changes with your entire care team, medical team and family - regardless of their network - to determine the best course of action. We decrease the burden that caregivers face by making it easy to find personalized on-demand care for a few hours, a few days, or overnight. Tracked via the Zarit Burden Interview 4-item screening questionnaire and EuroQol-5D (EQ-5D). The quality and value of the care that we deliver is validated to our clients in the outcomes and results they care about the most. One of those outcomes is lowering the cost of health care. Discover the difference for yourself. For those receiving care at home, changes in health condition are fairly common. The problem is most status changes are not detected early enough which can result in severe complications. We prevent complications by working with our clients to adhere to their specific care plans and identifying condition changes as they take place. We reduce unnecessary hospital admissions by combining condition specific clinical knowledge and real time insight to quickly triage and communicate condition changes with your entire care team, medical team and family - regardless of their network - to determine the best course of action. We decrease caregiver burden and improve well being by making it easy to find a personalized care for a few hours, a few days, or overnight. Delivering powerful outcomes to our clients also means providing meaningful value in form of lower health care costs. Discover the difference for yourself.